I just tuned into the fabulous new documentary on the 1992 Dream Team, the magical group of Olympic All-Stars led by Michael Jordan. If you grew up as a kid in the 90s like I did, Michael Jordan was the closest thing to experiencing Babe Ruth. It didn’t matter what team you were a fan of, watching Michael Jordan and the Chicago Bulls dominate basketball was a thrill right out of a comic book. Jordan played with passion, creativity, and inspiration, and he came to represent the icon of American achievement, proudly setting the bar for success higher and higher. The thing I like most about Michael was that he never shrank from the spotlight and never felt embarrassed to be who he was. Many icons of sports and popular culture exude a bitterness and resentment in the face of overwhelming media attention and praise, but Michael embraced it and owned it. Criticism did grow around Jordan, concerning the colossal commercialization of his name and likeness, but I always felt that criticism was a bit wrong headed. While it was certainly true that Michael lent his name to anyone with a big enough paycheck, he never pretended that it wasn’t anything other than enjoying the spoils of money and fame. 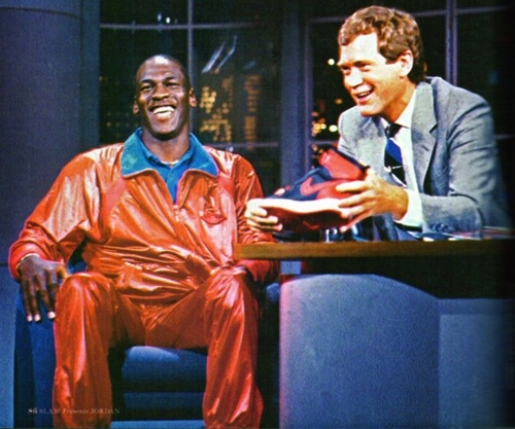 His appearance on the Late Show with David Letterman when he was then just a 23 years old emerging phenomenon, shows Michael constructing this public identity, which was a cross between a crass walking commercial, and, somehow, an unpretentious everyman burning with the universal desire to be great. Letterman, also young and spry, does his part in helping create the myth and legend, and the clip below is just a lot of fun. So the story goes that while on the road in Chicago, the Wheel of Fortune game show had a contestant drop out at the last minute. The producers found some guy named Raymond Taylor on the street, gave him a suit, and propped him on the stage. I have no idea if this is true or urban legend, but legend is the operative word when describing Raymond Taylor’s exploits on Wheel of Fortune. 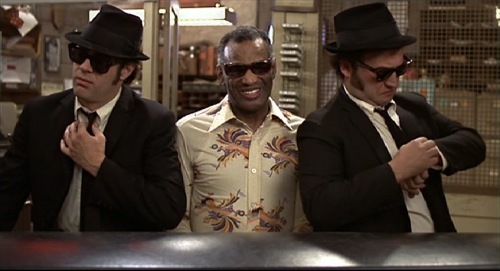 Raymond was a skinny Chuck Berry clone who could never look anyone in the eye, and was constantly fidgeting around the set. He was also TV gold. 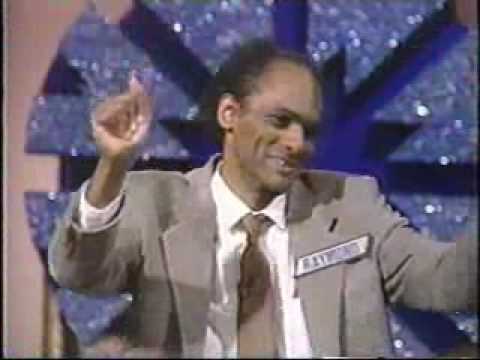 He was genuinely witty and cutting in all his remarks and timing, and he was a stunningly adept “Wheel” player. Many people assume, with racist underpinnings, that Raymond was a crack addicted clown. I’m not going to go that far. Television has a way of either making people conform with fear, or bringing out their inner star. I think this was the case of the latter. Raymond ended up winning over 80k in cash and prizes, and actually began to stalk the Wheel of Fortune studios looking for a job. The studio ended up putting a restraining order against him. It’s a bizarre end to a hilarious and peculiar story, but check Raymond out yourself in his best moments on his unreal Wheel of Fortune run. The greatest cover song the Beatles ever did was of The Isley Brothers 1962 hit, “Twist and Shout.” Written by Bert Russell and Phil Medley, the original song was a tepid little dance song, but when John Lennon and the Beatles got their hands on it, they redefined rock and roll, and gave the genre one of its most iconic performances. John Lennon’s throat shredding vocal is one of the greatest expressions of pure joy in the entire universe, and it’ll never ever get old. 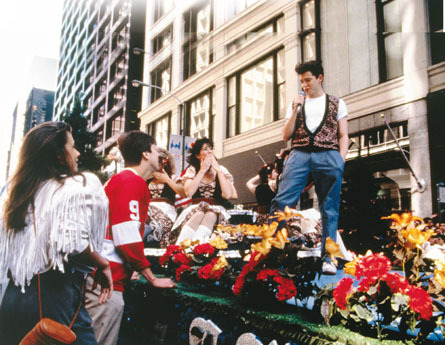 When John Hughes had Ferris Bueller (Matthew Broderick) sing the song on a float in downtown Chicago, he only added to the universal authority of the song’s power. It’s the best scene in a movie that helped put a big cultural stamp a whole generation of 80s and 90s kids. I wonder what sort of impact, if any, this film has on current and future youthful generations. I have a feeling people will always like it, after all, who doesn’t like Ferraris, ditching school, hanging out with the coolest kid ever, and singing “Twist and Shout” in front of 10,000 people? Also, Charlie Sheen sums up his entire life through a fictional character at the end. Amazing. (Insert daily CBS plug…) Remember to vote me as CBS’s best local NYC blogger by clicking these words! Thanks! Powered by WordPress v 5.0. Page in 0.543 seconds.